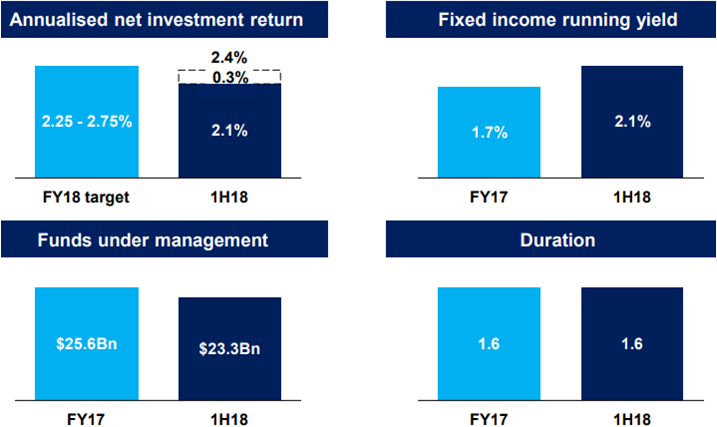 QBE Insurance (QBE) released interim results recently which showed a very encouraging performance across the half year. Net profit after tax for the six months ended 30 June rose 4% to US$358 million. Cash profit after tax was up 3% to US$385 million. The bottom line was boosted by robust premium growth, rate increases and fewer adverse weather-related events. The result was ahead of consensus expectations, and saw the shares well bid, with a gain of 7% on the day of the release. There were a number of positive features in the result, with the first half combined operating ratio (COR) coming in at 95.8%, and within a target ratio range of 95.0% to 97.5%. This as management notes is a ‘meaningful’ improvement on the FY17 COR of 98.2%. The company has guided for FY18 COR of 95.0% to 97.0%. We have been of the view that premiums would likely see significant upward pressure due to last year’s extreme catastrophe experiences. This is also a key aspect of the result. The group achieved an average premium rate increase of 4.6% during the half (compared with 1.0% in the prior period). Gross written premiums rose 1% to US $7.887 billion. Pricing conditions improved in all divisions, but especially in Europe, North America and Asia Pacific. Management have been looking to improve the performance of QBE’s business units, and have been conducting ‘Cell Reviews’ across the group. This has already met with some success in lifting performance. Management initiatives to ‘simplify’ the business through the divestment of non-core operations has also helped with the financial outcomes for the group. Across the divisions, the COR in North America improved to 97.8% from 98.2%, with average premium rate increases of 3.1%, more than triple the prior period. European operations delivered a solid performance, with a COR of 94.5% and average premium rate increases of 4.8% versus a 1.1% decline in the prior period. In Australia and New Zealand, the COR was stable at 92.3%, while the claims ratio saw a 1.4% improvement. Premium rate increases averaged a very healthy 6.6%. Asia Pacific remains the laggard with the COR improving, but still unprofitable at 108.5%. Having already sold the operation in Thailand, we wouldn’t be surprise to see further divestments within the region to remove a drag on the bottom line. Investment returns were lower than expected at US$287 million in the half, down from US$424 million. This was due in part to mark-to-market losses in the company’s fixed interest portfolio. The annualised net investment return came in at 2.1% versus 3.6% last year. Management are targeting an investment return of 2.25% to 2.75% for FY18. We continue to expect investment income to increase over the long-term on the back of a rising yield curve. The Board declared an interim dividend of 22 cents per share, in line with last year. Share buybacks have continued and management remain committed to a three-year programme of up to A$1 billion. Robust cash flows have also enabled an improvement in balance sheet strength, with the debt to equity ratio falling from 40.8% at the end of FY17 to 36.9% at 30 June 2018. We have previously said that with sentiment towards QBE at a low ebb (the company reported a net loss after tax of US $1.25 billion in FY17), a low hurdle had been set for sentiment to improve. This is in our view reflected in the reaction to the results. We have also felt that new CEO Pat Regan would also bring some positivity to the investment story, especially as much ‘kitchen sinking’ has already been done. It seems that the initiatives implemented by management during the half are already yielding benefits. This includes the divestment of businesses that generated an underwriting loss of over US$200 million in 2017. 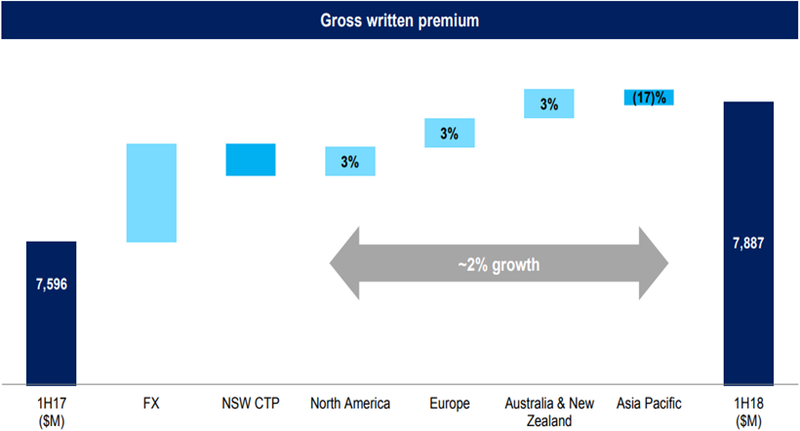 We see thematic tailwinds also coming through to QBE as premium rates continue to strengthen. A rising yield curve also bodes well for growth in investment income. Disclosure: Interests associated with Fat Prophets declare a holding in QBE Insurance. Greg Smith is the Head of Research at investment research and funds management house Fat Prophets.